JayWalk - All Your Xmms Are Belong To Me: Cream Or Sugar or Butter? 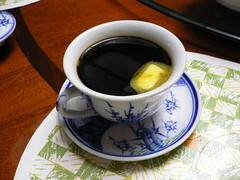 In my earlier blog, I mentioned the unusual practice of adding butter to your coffee. Well, because Jaschocolate wants to know, I shall tell the stories here. Yes. Stories. Plural. I have been asking around about this for the past few years and so far I have gathered quite a few versions, all somewhat a little different from each other. Feel free to add on more stories that perhaps you also know that I don't via the comments. Do ask your parents or grandparents if they know about Coffee and Butter (Kopi Goo Yew?). Ask your local kopitiam Ah Laos if they know of this. Would be an interesting story to uncover and share it here. Anyway, here's what I have gathered so far. 1) Butter was free back in the old days. I got this from my dad when he first stepped on Singapore shores in 1962. Those were the pre-independence days and there were many labourers then. To these coolies, the regular breakfast staple would be kopi loti (coffee and bread) and butter was a condiment, like salt, pepper and dark soy sauce, that is available on every table. In other words, butter was free and these labourers would help themselves to generous heaps of butter and added them to everything, including coffee. Their mindset was to get the most value out of the precious few cents that they spend on breakfast everyday. Also, being labourers, they tend to get hungry fast due to the nature of their physical work and so having an oily meal helped them to last until the next meal. A practice still in existence today in my part of Spitland. Though not butter but their cooked meals are all very oily. The only problem with this story is that in my own recollection as a kid, I did remember these yellow cans alongside the salt and pepper. Only difference was that I remembered them to be Planta i.e. margarine but not butter. Then again, my memory only go as far back as the early 70s and perhaps it was indeed butter a decade before that? 2) Butter lines the stomach. According the my MIL, who is a part-time kopi soh, some of the folks feel that butter lines the stomach to guard against the acidity of the coffee and hence prevent gastric. 3) Butter protects the lungs. MIL went further to explain the in the old days, labourers are more often than not chain smokers and a cigarette is usually part of the kopi loti breakfast. It was not uncommon for these chain-smoking folks to be coughing and wheezing in the morning. They believed that the butter oils the lungs like that of a lubricant and hence alleviate the morning coughs. 4) Coffee is more fragrant with the butter in it. This is fairly straightforward. Who can resist the heavenly bouquet of melted butter lingering in the air? I got this from Ed's dad who is a diabetic. He was the first person I knew that still drinks his coffee with a slab of butter to this very day. For us, our regular coffeeshop's kopi is coffee with condensed milk that serves the dual function of cream and sugar. Ed's dad explained that he switch to butter to avoid the sugar from the condensed milk. While it is true that one can simply use creamer (e.g. Coffeemate) to substitude, Ed's dad says that coffee and butter "比较香" as per my Point (4). 6) Butter keeps the coffee warm for longer. It is a common sight every morning to see retired uncles come downstairs to the coffee shop for their daily breakfast. More often than not, they will come armed with the day's newspapers. Nothing better than to have a slow and relaxing breakfast while the hectic bustle of everyday life passes you by. After all, these gentlemen have already paid their dues and are now reaping the rewards after decades of toil. The slab of butter would float on top of the coffee and slowly melt into a layer of oil. The oil would then spread evenly across the cup and thus sealing the coffee underneath. When the steam from the coffee is unable to escape, evaporation is hindered and the coffee stays warm longer. Just long enough for them to finish their daily newspaper read. Anyone has anything else to share? Proceed to the comments section. Akk: The picture was actually my morning coffee. Actually hor, with the butter in it. Not bad leh. The oil from the butter give the coffee a rather smooth texture. Drink that time feel very 顺口. And pang pang too! i ask around liao, bo lang drink b4 leh. u sure it was in sgp? Spinnee: Yes, it's in Singapore and likely Malaysia too. Maybe those folks you ask are not old enough? You should be asking people around the age of at least 65? i ask my grandma about it.. and she was like, "you know how to drink meh?" er.. i think i will try it when im not schooling..
i will try my coffee with butter tomorrow and give my verdict...something new for me to know! Gary, Spellbound & Jaschocolate: I tried liao. Not bad. The aroma is very fragrant but I especially like the oily texture of the coffee making it very smooth as it flows down your throat. i tried the coffee with butter today.. wah.. the taste was heavenly sia, better than the normal coffee we make.. now my grandmother willing to make this coffee everytime before going to school..
Gary: Your grandma quite sayang you siah. Still, this type of thing, I think better not to consume too much since we are talking about butter here. Moderation is key. Besides, if you have it everyday, you will take it for granted and not appreciate it as much. ya.. besides, im not addicted to coffee where i need to have it everyday.. lucky i still have a wide range of beverages to make every morning..
Gary: Ahh.. addiction. I have learned to be a master of all things and never a slave to any.